The Iranian regime has used a recent militant attack on a pipeline to widen arrests of Ahwazi Arabs with at least arrested this morning (18 November), including a prominent poet. The latest arrests confirm that the attack is being used by the authorities to frame and punish innocent people and non-violent activists, including those who use traditional cultural means to express Arab sentiments. 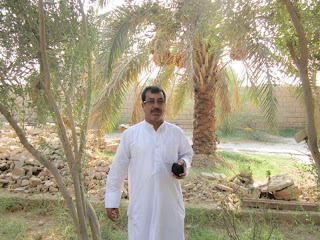 Renowned Ahwazi Arab poet Abdulal Aldoraghi, known as Abu Shaima, pictured, was among those taken from their homes in Ahwaz City's Kut Abdullah district. He had attended the funeral of another Ahwazi poet, Sattar al-Sayahi, who died in mysterious circumstances after being released from custody for questioning. Mourners held protests at the funeral, which attracted hundreds of Ahwazi Arabs. Arrests of at least 17 other Ahwazi Arabs were reported in Mashali, Darwishiya, Khozami and Hey-althowra on Sunday morning. In addition, Adel Mowla Atshani (25, son of Ismaiel) was arrested by intelligence services in Hamidiyeh City on 12 November. According to recent reports, his family home has been raided and he is being tortured. At least nine Arabs, mostly from the Ka'abi tribe, were also arrested in the Khalaf Al-Moslem area near Shush this week on charges of involvement in a recent gas pipeline attack, which security forces have blamed on foreign governments.